Grow your culture in the first turn, followed by your industry. Your finance can trail your culture by one in the beginning, since you will not need to remove your population from the building back to the harbor as much as your population. 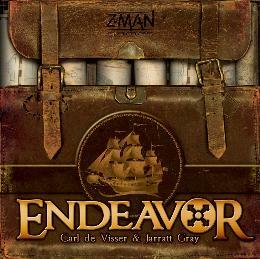 Overall, the Endeavor board game is about balance. You need roughly two population pieces for each building you can have an action on. If you have more population then buildings, then try to attack and “burn” the extra population or use a double ship or ship and occupy actions. If you have less population then building, try taking the “draw card” action since it uses only 1 population. Salaries - The worst move you can do is not to get a population off a building space. You lose the use of the population AND you are preventing the use of the building. Don’t take the market on your first build phase. Take the ship yard for the extra culture (you still need to get one more culture via tokens) or the Workshop so that you can get better buildings next turn. If you do take the workshop in the first phase, make sure your next building has an “action” space to put your higher population. In the beginning, shipping and occupying helps to gain needed tokens as well as presence (which can lead to better cards). Near the middle of Endeavor, start to look towards gaining cards. Finally, during the end game continue gaining cards and do a few strategic attacks that net points. Cards in the beginning are weak, but they do help to give a needed boost to your economy. Of course you can discard them for better ones down the road, but that means you have used an extra action that could have been used elsewhere. So one or two early in the game is ok, just don’t go overboard with card in the beginning. Wait until later when they are the powerful. Attacking is expensive in Endeavor. Attack if you can gain one or two of the connection tokens, to gain a few points from the city and its connections. For example, if you have a city surrounded from all sides, then taking that city will net you a lot of points, or if you need another “presence” point in order to get a more powerful card. Be careful of a counter attack, so if it to connect all your cities, maybe save it for the last round and when you target doesn’t have the population to retaliate.